The effort to rescue the teenagers involved operations between Lagos, Ogun, Ondo and Delta State police units. While it might look simple that Igbonla’s pupils were kidnapped in Lagos, the kidnappers didn’t keep them in Lagos. We must thus commend the bravery of the men of the Nigerian Police for coordinating operations at such a massive scale. 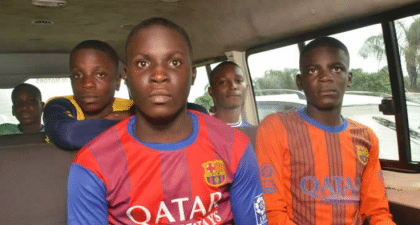 Twenty members of the gang that abducted six Lagos State students for more than two months died in gun battle with the police earlier on Friday, during the rescue operation in the creeks of Ondo state. Lagos State Commissioner of Police, Mr Fatai Owoseni disclosed this at a news conference in Lagos. He also said one civilian volunteer died, while eight policemen and four other civilian volunteers sustained injuries. Owoseni said that a suspect, who attempted to swindle the parents of the students by asking that they should bring ransom to Abeokuta, was arrested. He is in police custody, he added. The police chief praised the South West Governors for demonstrating clear commitment to combat crime in the region, saying that the communiqué issued in Abeokuta with respect to creation of Joint Security Task Force for the region, is already yielding positive result. Governor Akinwunmi Ambode, who was away in Switzerland delivered a message at the conference through the deputy governor, Oluranti Adebule. Ambode hailed the successful rescue of the six students of Igbonla Model College, Epe. He gave an assurance that the government would utilise the holiday to reinforce security in all schools in the State, especially in the suburb and riverine areas to prevent a re-occurrence. He said he remained totally committed to ensuring the security of all residents especially students and would spare nothing to ensure that schools remain safe from all forms of crime and criminality. “The issue of security is a social contract that we have signed with the people of Lagos and we would ensure that we do not disappoint. As far as our schools are concerned, we are going back to the drawing board to secure our schools before the next academic session”. Ambode commended the collaborative efforts by security agencies from Lagos and Ondo States. He specially thanked the Acting President, Professor Yemi Osinbajo for his intervention towards ensuring the safe rescue of the students. Adebule presented the rescued students to the media and said they would be debriefed and taken through comprehensive medical tests so as to ensure that they recover from the trauma they might have passed through while in the custody of their abductors. Ondo State Governor, Mr. Rotimi Akeredolu commended Acting President Yemi Osinbajo and Governor Ambode for working tirelessly on the matter, saying that the duo demonstrated uncommon interest in the whole process leading to the safe return of the students. Akeredolu said he never believed the kidnappers could be hibernating in Ondo creeks until he was told about a month ago during the National Economic Council (NEC) Meeting in Abuja by Osinbajo, and later Governor Ambode. He said he immediately deployed his deputy, Mr Alfred Agboola who is from the riverine areas in Ondo, to take up the matter. He said Agboola immediately swung into action and worked with the Delta State Deputy Governor, as well as security agencies to ensure the safe return of the students. Akeredolu said: “I must commend Governor Ambode for his commitment to the rescue of the students. At the meeting of Western Nigeria Governors’ forum held in Abeokuta on Monday, we discussed the issue of the students and Governor Ambode mentioned the issue of joint security patrol in our riverine areas.